On 16 August, Rand Logistics, Inc. a major provider of bulk freight shipping services throughout the Great Lakes region, announced that the company has received five-year International Safety Management (ISM) Code certifications on eight of its Canadian vessels by the American Bureau of Shipping (ABS), the Company’s third- party surveyors. The first vessel in the Canadian fleet achieved ISM compliance in November 2016 and the eighth vessel obtained certification the week of July 17, 2017. 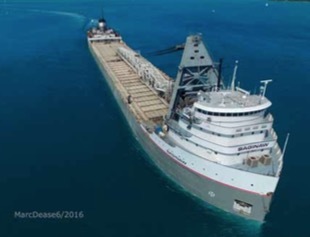 It is expected that the ninth Canadian vessel will be certified after completion of its ISM audit in November, after returning to service to support the grain harvest. The International Safety Management (ISM) Code is an international standard for the safe operation of ships and for pollution prevention.The ISM Code, to which participation is voluntary, establishes safety-management objectives and requires a safety management system (SMS) to be established by the Company. In June, Rand Logistics, Inc., a major provider of bulk freight shipping services throughout the Great Lakes Region, announced the launch of its second annual Marine Miracle Month, a programme to benefit children’s charities. As the cornerstone of the 2017 Marine Miracle Month program, Rand will donate ZAR 0.68 for every tonne of cargo carried by its fleet during the month of August to non-profit organizations with a primary focus on the health and wellbeing of children. The company will provide its customers the opportunity to select the children’s charity of their choice and will make the donations in each customer’s honour. The donation amount will be based upon the total tonnes each customer ships during the programme month. Rand’s goal is to exceed the total donations raised during the 2016 Marine Miracle Month programme. “We were overwhelmed by the interest and positive response our customers, employees, suppliers and community partners showed towards the initiative in its inaugural year,” stated Aaron Degodny, Rand’s Chief Commercial Officer. “In 2016, more than ZAR 1,704,975 was raised for charities dedicated to the health and wellbeing of children, with more than 30 customers participating in the program and just as many charities benefiting. We are hoping to expand the programme this year and exceed last year’s total contribution." Customers will work with their Rand representatives to select a qualifying not-for-profit organization. Selected organizations must hold 501(c)(3) status in the U.S. or be a registered charity in Canada providing services and benefits to children. Rand Logistics, Inc. is a leading provider of bulk freight shipping services throughout the Great Lakes region. Through its subsidiaries, the company operates a fleet of three conventional bulk carriers and 12 self-unloading bulk carriers including three tug/barge units. The company is the only carrier able to offer significant domestic port-to-port services in both Canada and the US on the Great Lakes. The company’s vessels operate under the US Jones Act – which reserves domestic waterborne commerce to vessels that are US-owned, built and crewed — and the Canada Coasting Trade Act — which reserves domestic waterborne commerce to Canadian registered and crewed vessels that operate between Canadian ports.